The other day a friend confided that he never got, and still doesn’t get, Andy Warhol. “What’s the deal?” he asked. In the spring of 2009, I wrote a glowing review of the pop artist’s show in San Jose for kqed.org, so I guess he thought I might be able to shed some light on this weighty subject. Let’s find out. 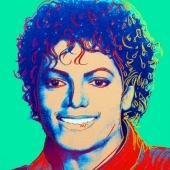 We were talking about Warhol because a 1984 Warhol painting/silkscreen of Michael Jackson had just sold for more than a million bucks. That’s a lot of money for a piece that, according to an employee of the Andy Warhol Foundation, may not even be a one-of-a-kind. The Warhol sale was the first opportunity for the art world to experience what the collectibles market went through immediately following the late-June 2009 death of the singer-songwriter-dancer. Back then, just about anything associated with Jackson—from white gloves to signed copies of Thriller—was being offered for incredibly inflated prices on eBay. Mike Gutierrez of Heritage Auctions in Dallas has seen this sort of thing before. “This always happens after a famous celebrity passes away unexpectedly,” he says. “There is a mad dash for their collectibles, prices soar, and then six months later they settle down to where they should be.” Indeed, in the current collectibles market, that settling may already be happening. “There is, and there has always been, enough Michael Jackson material on the market to saturate the needs of collectors,” says Gutierrez. These Andy Warhol soup cans cost $12 each in 2004. Back to Warhol, though, and why I believe his work is so brilliant. On the one hand, Warhol was just another artist who made things—from paintings to prints to sculptures to posters—that people could buy and collect. For example, I own a set of four Campbell’s tomato soup cans, each of which is wrapped in a label that takes its pop-art colors from Warhol’s “original” soup-can prints (the cans were produced after his death in 1987, but since Warhol hired assistants to make most of his art anyway, I’m not sure what the difference is). But Warhol was a conceptual artist, too, whose greatest work of art, many believe, was being Andy Warhol. What did it mean to be Andy Warhol? Well, it meant knowing how to twist the dials and pull the levers of the staid art-world machinery. Sometimes the goal was simply to impose objects of seemingly superficial content—cans of soup, portraits of rich socialites, flowers, cows—into a world that takes itself incredibly seriously. Other times he gave us tastefully rebellious decorative objects, whose highest purpose was to look pretty. In short, he often set his sights deliberately low. Warhol managed to pull it off because he was much more than a mere court jester. He was a royal among royals, whose commercial success and critical acclaim were his Kevlar. I admire the fact that he was willing to flirt so routinely with disaster, and I like the way he used his bully pulpit to hold up a mirror to America so that we could take a good, Technicolor look at ourselves. Now to see if my friend agrees.